9 Safety Tips Every New Driver Must Know to Live! Usually, when a new driver gets their driver’s license, they are not even aware of those dangerous situations which often appear on the roads. There is no one who is able to immune themselves when driving a car, however, following some rules can lower the risks. A lot of circumstances, which at first glance seem to be harmless, ultimately lead to accidents. Only the experienced drivers know these circumstances. It’s funny because the new drivers underestimate the importance of theoretical training and think that if they could get a driver’s license, they don’t need any theoretical tips anymore. Today, Umer Financials would like to try to describe some of the rules, the observation of which may help to avoid the dangerous situations and to protect the vehicle from some serious technical problems. Not all drivers know that the road is very dangerous in the first minutes after the beginning of the rain. The water is mixed with the road dust and dirt, it forms a liquid mush. During this period, you should be extra careful with the sudden movements, round the corners at the low speed, keep a big distance between the vehicles. While driving you can carefully check the conditions of the slippery roadway in order to understand how dangerous it is. To do this, turn the second gear and at the speed around 15-25 km/h rapidly press the gas pedal. If the wheels of a vehicle slip, the road is too dangerous and it is necessary to observe some attention and care. Note that when driving on a slippery road it is better not to go around of a bump or hole in the road, but avoid the unnecessary movements and gently move on, reducing the speed. The most important quality of the driver that all newcomer need to educate themselves with is a complete control of the emotions. Driving calm doesn’t mean a total relaxation and easing of the reaction. Be careful when you hear a horn. Inexperienced driver under that stressful atmosphere may make the unreasonably sharp moves which may lead to the accident. A complete calmness should be kept too because the rude behaviors of other drivers is not a rare case. Over confidence is more dangerous than inexperience. The probability of an accident among the beginners run after the first 5-7 thousand miles is multiplied when the fear and caution were replaced with a dangerous complacency. 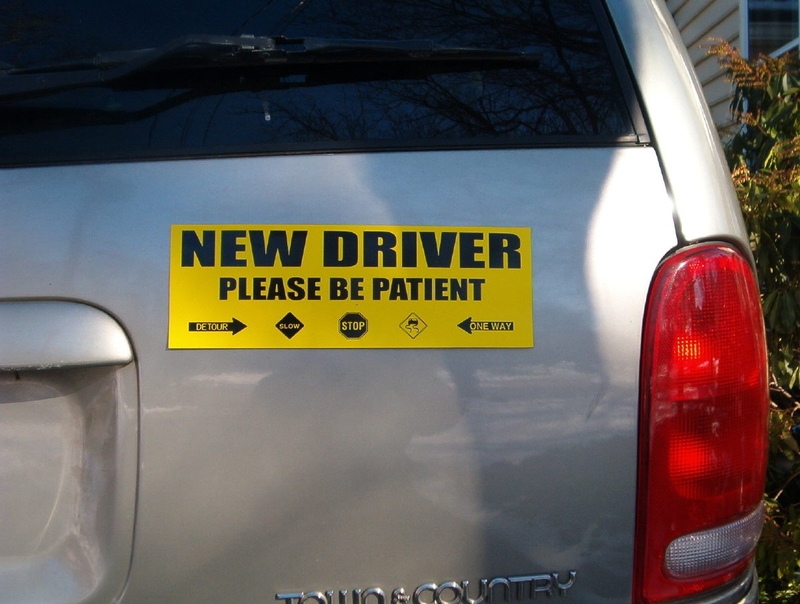 After getting used to cars and traffic, new drivers want to prove it to others and assert themselves. Seeing the aggressive driving style of those people who like to “cut off”, “weave in and out of traffic” and etc., they begin to imitate this not the best driving style. Remember, self-confidence is punished in most cases. Everyone who begins to understand what led to the safe driving needs to feel the car dimensions. However, neither the training in a driving school, nor the first attempts to self-drive of the car does not give confidence in the sense of size. More than 55% of people (mostly women) slowly and painfully learn to feel the edges, often risking their bumpers, wheels, mirrors. Did you learn to feel your car’s size? All your signals have to warn the action. Remember how many times per day do you curse when the car which moves ahead, doing some strange maneuvers without the proper light-signaling devices. Don’t be afraid to use light and sound signals, it is always better to prevent accidents than to join in. Every even slight movement on the roadway should be accompanied by a turn signal. Believe us; it makes life much easier for the rest of the drivers, thereby reducing the risk of getting into an accident. Have you ever wondered how sensitive our hearing? When you drive a car, the sounds, or rather their correct perception can reduce the risk of an accident. So try to go at least with a slightly opened window. So you can always be inside the action and to respond not only to what you see. It is believed that the safe distance is equal to half the speed. But when it’s rain, fog or ice it, of course, increases, because the road is wet and the braking distance increases by 20-30%. If you were in a fog, do not leave your lane unless you have to. But if such a need arose, in advance, turn on the turn signal. For an inexperienced driver, it is desirable to minimize changeover on streets with dense traffic and multilane traffic. Always drive carefully observing interval and distance. The golden rule of high-speed driving: if driving at speed you can read the number of a car in front of you, remove the foot from the gas. In this case, you are too close and hardly have time to brake in an emergency situation. Some experienced drivers always say: “you never know how fast you will come”. This rule, in our opinion, is also very important. Try not to think how much time your road will take. The most significant thing on our roads is to stay alive, and the rush, as you know – the first step to the accident. Safety is the most valuable thing.